Vacation rental cabin / bungalow. Sleeps 18, 5 bedrooms, 4 bathrooms. No pets allowed. 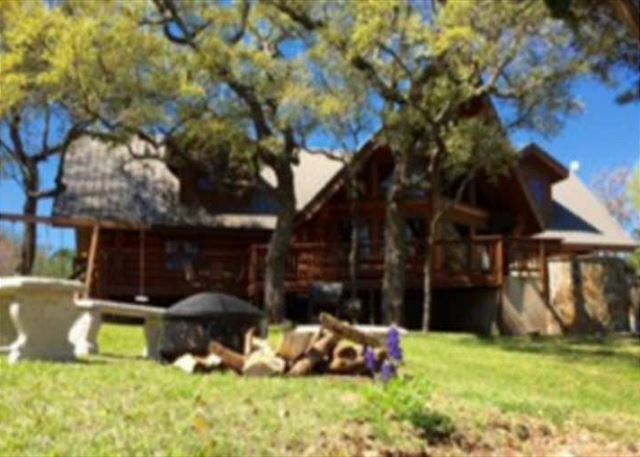 Haynes Hideaway is a beautiful two-story, log home situated on the cove water of Log Country Cove. The outdoor area offers a lovely pool and hot tub. A flat screen TV is strategically placed so that you relax in the hot tub while watching your favorite program. The refrigerator on the patio gives you plenty of room to store your goodies. You can make s'mores or roast wieners as you gather around the fire pit for story telling or reminiscing with friends and family. A swing set and basketball goal are also on this property. Fishing is allowed along the water's edge and requires a fishing license for those 17 and older. The log home will accommodate a maximum of 18 guests. Three bedrooms are located on the ground floor. The master bedroom is complete with a king bed and master bath. The jacuzzi tub in the bath is perfect for relaxing after a busy day. Bedrooms 2 and 3 each have a queen bed. A bath is just down the hallway. The open floor plan includes a great room, kitchen and living area. The flat screen TV, DVD player and Dish Network will entertain you when the outdoor fun has ended. The kitchen is supplied with enough dishes, flatware, pots/pans for a crowd of 18. A Keurig coffee maker is in the cabin so be sure to bring your K-Cups! You just supply the food and people. For your convenience, there is a washer/dryer in the small utility room. Upstairs Bedroom 4 has a king bed, futon, 2 twin beds, master bath and jacuzzi tub. Bedroom 5 has a queen bed plus a futon. A sleeper sofa is in the living area. 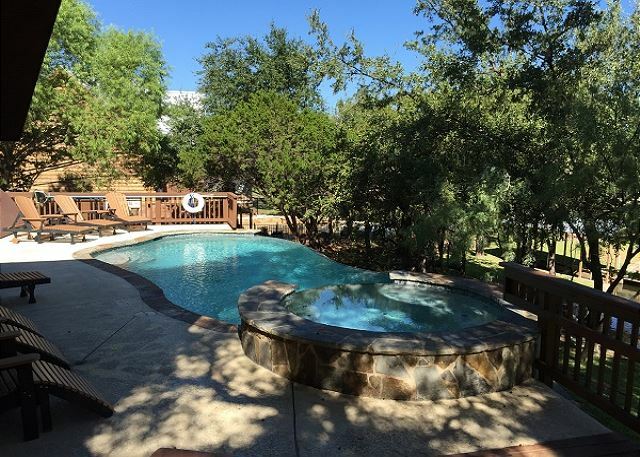 The lovely pool and hot tub are found on the patio behind the cabin. Relaxing in the hot tub while watching the TV outdoors is a definite plus. The outdoor refrigerator gives additional space for your goodies. Beyond the pool the fire-pit is a perfect place to gather for an evening of reminiscing, roasting hot dogs or making S'mores. If you like fishing you can fish anywhere along the water's edge. Fishing is allowed for all, but 17 and older do need a Fishing License. Additional activities include a swing and basketball goal. When you are ready to venture beyond the Haynes Hideaway property, head for the common area provided by Log Country Cove for all guests. Sand volleyball, horseshoes, washers and other outdoor games will provide fun for all. The rope swing is a popular place. 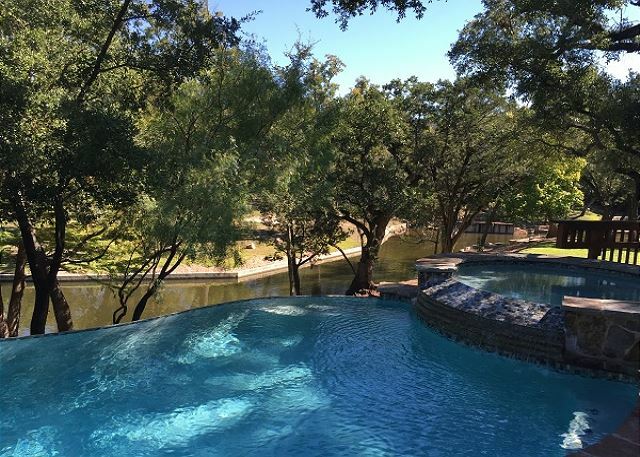 It is placed in just the right spot for swinging out over the roped off swimming area and splashing into Lake LBJ. Fishing is allowed all along the retaining wall or from the pier. In late May a water trampoline will be put into the lake for all guests to enjoy. The Sarayu Trail winds throughout 170 acres. It is a beautiful trail cut throught the undeveloped areas of the resort. You can walk or hike the 2 1/2 mile trail and enjoy the sights and sounds. Before you head back to the cabin, be sure to walk out on the Sunset Pier. From there you can take in the beauty of the lake as the sun sets. Hill Country sunsets over the water are quite spectacular. The Boat Room has watercraft rentals for our guests. Pontoon boats, SeaDoos and a ski boat are available for rent. If you want to test your rowing skills you can rent a canoe, kayak or stand-up paddle board. Paddle boats and the Go-Boats are really fun as well. There are many sites to see as you cruise up and down the lake. Haynes Hideaway is the ideal place for fun and festivities. Each season supplies a different atmosphere. The summer months are filled with many people hustling and bustling around. The common area echoes with the happy sounds of summer fun. Early fall is excellent for those wanting a quieter mood. The days are less congested, but still offer weather warm enough to jump in the lake and utilize your own watercraft or rent one of ours. The nights cool off making the fire-pit a great place to cozy up with your friends or family. Winter offers the lowest rates of the year and a serene climate with plenty of time to enjoy nature. Spring brings the bountiful display of wildflowers. Hope to see you at Haynes Hideaway! This cabin was absolutely Perfect for a week getaway with 9 women! We Loved the bedroom placement and adequate size of the bedrooms & bathrooms. The washer and dryer was very useful to us, and so was the extra refrigerator outside. We used the hot tub almost every night. I will definitely consider renting this particular cabin again in the future! The customer service was also “top-notch”!